I bought a Ikamag Laboratory Heater Stirrer from ebay for about £15. I had to replace two switches that were burned out but they only cost about £3. I've been using the Hotplate in my sous vide experiments but I thought I try and see if I could replicate the working of a Thermomix food processor that can be very useful in making sauces automatically. I believe quite a few restaurants now use this type of food processor to reliably make "tricky" sauces like Hollandaise. Of course Hollandaise isn't tricky for the average eGulleter but I figure if you have one less thing to think about when you are making your eggs benedict or steak frites that has to be good right. Well I tried it tonight and here are the results of my first proof of concept. 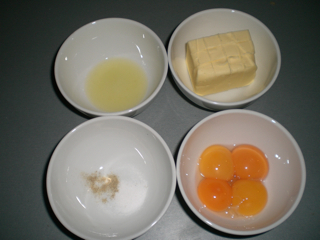 Here's the mis en place - unsalted butter, lemon juice, salt and pepper and four organic egg yolks. Here is a picture of the equipment. You can see the Heater/Stirrer on the left. To the right is my PID unit but the only function it is serving here is to digitally display the temperature of the hotplate. 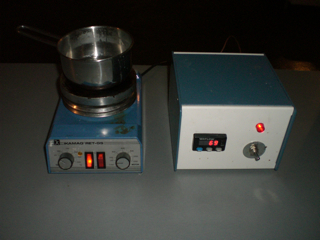 The hotplate is very stable but the temperature is set via an analog dial so it is helpful to see a digital readout of the hotplate. For Hollandaise I am shooting for 70C. This is a close up of the non-stick stirrer bar. The beauty of this setup is you can use any pan size or stirrer size. So I set the dial to 70C, dumped everything into the pan at once, set the stirrer to about 2000RPM and left it for 8 minutes. There was zero manual intervention from me. Et voila... Laboratory Hollandaise. Pretty good for my first go - absolutely delicious and importantly foolproof, repeatable and consistent every time. I think when I do this again I'd probably melt the butter a bit more first. The magnet that turns the stirrer isn't superstrong so melting the butter beforehand would probably help in the stirring. Obviously it would be good to try things like bearnaise and other sauce derivatives also things like risotto could have the stirring automated. Likewise it would probably be brilliant for things like syrup making, tempering chocolate or custard making that require precise temperatures. Anyone else want to give it a try? Maybe I'll sneak into the lab at the hospital next time I am in L.A. and give it a go!! (yeah, like that is gonna happen). I would love to see some video of this. Just a short clip of the stirrer in action. I remember using these in Chemistry in the 70's ( ) and thinking how great they'd be for cooking. Is this specifically FOR cooking or is it lab equipment? jsmeeker - glad you like it. It was really fun to do. The stirrer bar is great fun as it can go very fast up to about 1200 rpm. It is quite entertaining to watch it form the sauce. I am not sure that egullet supports video though. Maybe I need to do a You Tube! Dockhl - it is lab equipment but I am repurposing it for cooking. Then I need to get one ! Do they make something like this for cooking? Do you wait for the butter to melt before using the stirrer bar? I thought about the very same thing when I saw the prices of the immersion circulators. A good magnetic heater is ideal. I used it many times in the lab and the nest shaped heaters for round bottom flasks would be ideal for sauces. You could serve in the flask at the table. Yes it definitely has possibilities especially for that Molecular Gastronomy vibe. Seriously though this lab stuff is super precision and is a pretty cheap way to get very accurate results. Dockhl - this is lab equipment but there is something called a Thermomix that does the same thing (and quite a bit more, but it is harder to clean) for about $1,000. I have never seen one of those before, how does the stirrer works? I can't see in the picture.. I mean, I can't identify it on the picture. BTW, great work, keep us posted with the next experiments! 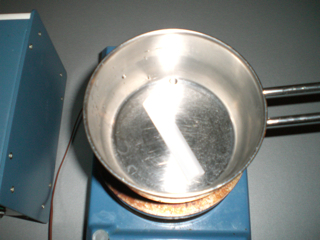 It appears to be a standard magnetic stirrer - a disposable coated magnetic bar in the vessel is turned by a corresponding one in the heater/stirrer, magnetically attracted through the beaker. Must admit I'd never personally considered one for cooking, but it's a brilliant idea. oh! now I get it, that's a brilliant idea indeed. I must confess that I was looking for a mixer gadget. lol. My roommate, a PhD grad student, suggested the same thing. What shuold i look for in a secondhand heat plate/stirrer on ebay? They're pretty basic really. Just look for one with a reasonable power output (though most times I am not heating anything above 80C for Sous vide and sauces) and good rpms. If you can find a good cheap one with digital settings that is a definite plus as it makes setting the temp and revs much easier. also consider where the "used" stirrer has been used... remaining wary for bio-hazards, and such. And consider where (and whether) you will be able to get replacement stir bars. Edmonds Scientific probably has them by mail-order. Karen - good point - although my heater/stirrer unit had been used, I purchased a brand new stirrer bar itself. These are about 8cm long PTFE plastic (I think) covered metal bars and only cost a couple of pounds. Cleanup is a snap you just put the bar and the pan you used straight into the dishwasher. I knew that old graduate degree in chemistry would come in handy some day. These are also useful for melting chocolate and making dessert sauces. Akin to the hollandaise made by the OP, making mayonnaise is also easy. I also used one of these and a 1000 ml. Erlenmeyer flask to make spiced cider for a Halloween party. The kids loved it, especially when I threw a couple chunks of dry ice into the flask for the vapor effect. These lab stirrers are surprisingly cheap, the Teflon-coated stirrer bar is pretty much impervious to anything, and clean up is a snap. I also experimented with it to use in heatgun/dogbowl coffee roasting, but the stirrer is best suited for liquids, emulsions or semi-solids. It did not stir a batch of green coffee beans particularly well. This got me thinking - on the assumption that larger stirrer bars aren't manufactured (I'm thinking something taller, or X-shaped if a narrow bar falling over is a concern), how much effort would it be to make one's own? A bit of ferrous alloy, and a coating - I've heard 'tool dip' is cheap (but not necessarily food-safe). Perhaps there exists some other way of fashioning a more useful stirrer? It may appear that I'm imagining replicating a StirChef, but criticisms posted elsewhere suggest it's too weak, fragile, etc. - to say nothing of cleanup, which would be much easier with a stirrer bar solution. they have laboratory overhead stirrer that you could use. or there might be away of adapting a food mixer to with a metal paddle ? 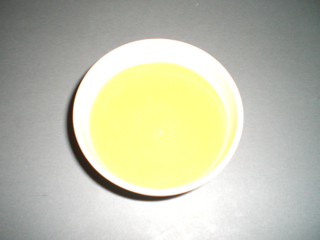 Why don't you use clarified butter? The SpinPlus X-shaped bar looks pretty efficient. My opinion is that you shouldn't use clarified butter for a hollandaise style sauce because whole butter has a much richer, rounder flavor to it than simple clarified and it emulsifies just as easy. The only thing to be careful with is to watch the water/liquid content of the emulsion carefully because the butter solids can thin out the sauce too much. One of the surprises from our move to Switzerland is the availability of kosher charcuterie. Sausages of all types, confit, mousse, rietttes, etc... One of the recent finds is this block of smoked beef. It has a nice fat layer in the middle. Any thoughts on how to use it? Should I slice it thin and then fry? I Bought a Tutove – Now What? Long story, but I have a friend with whom I share a lust for French patisserie in general and kouign aman in particular. We have another friend, kind of a starry chef in France. We'd like to surprise our Parisian friend by being at least marginally competent with the kouign the next time we meet up. I had always heard of a specialty rolling pin called a Tutove (I think it's the name of the manufacturer). It's supposed to be the Secret Weapon of puff pastry. The idea is that the pin has grooves/ridges that better place butter into the layers of dough. So I found one (a real one, made by Tutove) on Ebay at a good price, but I need any basic tips y'all have for using it. Anyone here use one, or have a resource for how to roll with a Tutove?